Ed Holmes and Associates is excited to offer High Definition Laser Scanning & Surveying services to the Asheville and Western North Carolina Area. This is a relatively new technology that offers a tremendous increase in the number and types of things that can be measured and surveyed that could not be easily measured using other conventional surveying technologies. The addition of 3D Laser Scanning utilizing the Leica Scanstation 2 and Cyclone point cloud software represents a paradigm shift in how we think about surveying. How can Laser Scanning be used? Architectural details can be scanned for replication for repairs, etc. Precise information for tie in of expansions to existing buildings. Scan Data can provide pre-construction topographic and location information for a wide variety of civil engineering projects including roadways, parking areas, storm water detention structures, wastewater treatment facilities, buildings, and more. As-built information for water and wastewater treatment facilities can be more easily scanned and measured than it could be located by a traditional survey crew. Pipe diameters and tank dimensions can be calculated from as-built scan data. Large storage tanks can be scanned to determine their volume. Volumetric data can be used to calibrate gauges on tanks. 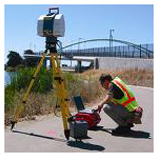 Example: American Surveyor Magazine Article on Laser Scanning Levees in New Orleans after Hurricane Katrina. Scans can be made throughout the construction process for quality control and assurance, potentially saving thousands to hundreds of thousands of dollars in liquidated damages for project delays. Foundation Surveys and Anchor Bolt Surveys to make sure pre-fabricated steel packages will install smoothly. Building Pad elevation verification and surveyor’s certifications. When things aren’t built to plan, quick as-built data is needed to prevent costly delays and allow for speedy solutions for getting back on track. As built data of the roughed in structure can be easily acquired for installers including wall and floor systems, windows, doors, elevators, etc, allowing systems to be pre-fabricated to the roughed in structure, saving money in material waste and costly on-site fabrication. Scan surveys can help in determination of completed percentage of project for payment authorizations. Example: Canadian company SCDS using laser scanning for evaluation of elevator shaft construction. Newly constructed concrete slabs and other surfaces can be scanned to determine if any gross deviations exist from level so these can be addressed before continuing construction. Building Retrofits: Scan data inside vacant buildings can help potential tenants or purchasers assess a given building as being suitable for their use. This same data can be used to design infrastructure and processes to fit within the existing building to speed startup of the business. Measurable site data can be presented and measured in Leica’s TruView web viewer. Scanning can create a three dimensional record of a crime scene that can be studied long after the scene has been released. Traffic accident scenes can be captured in 3D for vital evidence that could sway the outcome of a civil or criminal case or insurance settlement. While ideally law enforcement agencies will be working towards acquiring their own equipment and training their own personnel, owner/operators of 3D laser scanning equipment like Ed Holmes and Associates can be contracted as the need arises. Surveyors and engineers can legally sign and seal their findings and be relied upon as witnesses. Accurate determination of volumes when compared with earlier scan data for quarries, mines, borrow pits and stockpiles. Periodic monitoring of landfill cell volumes without having to send personnel into the open cell area. Surveying with the scanner as replacement for helicopter flown DTMs. Data can be obtained with minimal road closures (shoulder closure needed) and with less risk to personnel than traditional survey methods. High definition surveying in cases of roadways with poor drainage causing hydroplaning. Areas can be identified and repaired using designs from existing condition surveys from scanner data. Intersection safety can be assessed from models from point clouds, with particular attention to sight distances, roadway grade, and signal placement. Areas where landslides have occurred and require stabilization can be surveyed for analysis without having to send personnel into the slide area for survey shots. Bridge information can be collected via scanning and used in a GIS to evaluate priority of bridge maintenance and replacement projects. 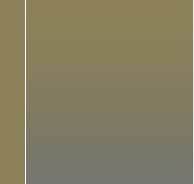 Scan data can be used for existing condition surveys for bride replacement design. Scanning during construction of bridges to verify fit of steel and pre-cast concrete members before delivery. 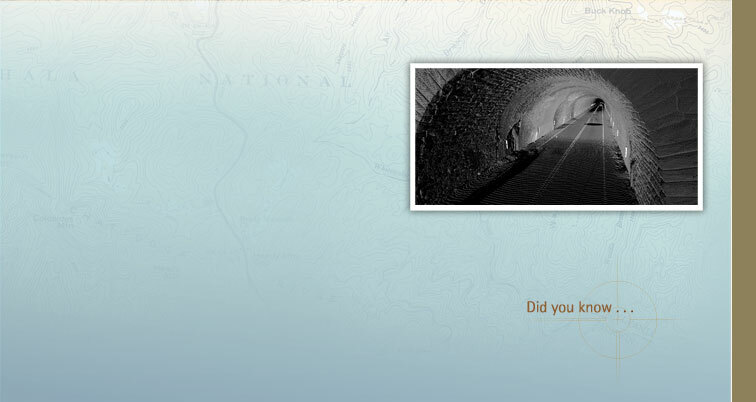 Tunnels can be scanned for design of linings and evaluation of tunnel dimensions. Location surveys for widening and improvement projects. Plan views, profiles, topography, and cross sections can be extracted from scanner data with high resolution detail. Scan data can be collected for signs and cell towers to determine compliance with ordinances. Dimensions can be determined in minutes without having to physically touch the sign or tower. 3D Determination of building setback compliance for inaccessible roofs and overhangs. New or existing sites can be evaluated for compliance with the Americans with Disabilities Act. Slope percentages, walkway and ramp widths and other information can be calculated from information rich scan data. Cities like Asheville, NC require landscape surveys in their development process to include all existing trees on a given site. Scan data can show a Landscape Architect not only the existing tree locations, but an idea of the quality of the specimen trees from the scan data of the branches and canopy. Post construction as-built scans can help the municipality ensure required sideyards and bufferyards have been maintained and properly filled in with the required mixture of plant species, of appropriate heights. Buildings, Dams, Bridges and other structures can be monitored for motion and settlement by comparison of subsequent point clouds (thousands or millions of points) instead of a few representative points (tens of points). Airport Runways can be scanned in high definition with minimal closure time and analyzed for deterioration of the surface or subsidence in the subgrade. Walls can be scanned and modeled to determine the extent of any bulge and monitored for changes over time. Scanning and modeling of Golf Courses, high end homes, race tracks and other high profile sites for use in creating visualization tools for proposals, presentations or marketing. Modeling & Fly through animation can be created from point cloud data to help in conveying project ideas. Many older public park sites can not be fully accessed by those with disabilities. Photo and Video documentation along with 3D modeling can help bridge the interpretation gap in bringing the resources to these individuals. A 3D CAD Model fit to the point cloud data. Animated Fly Throughs of the point cloud in movie format. These are but a few of the currently know options and uses for laser scanning technology. New uses are being thought of every day by working professionals. 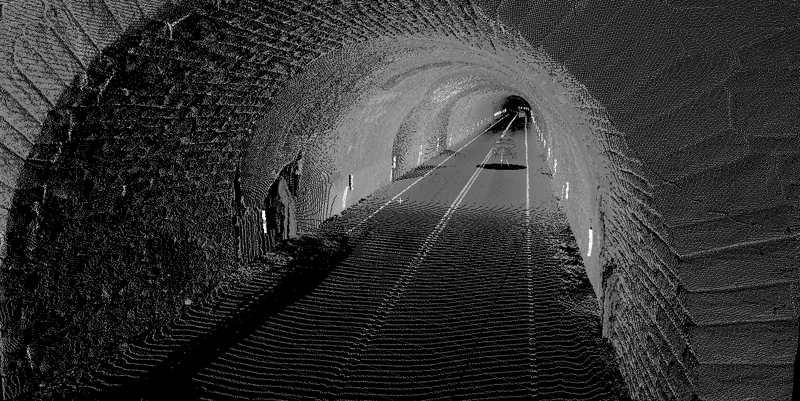 How can laser scan data help your business, and how can we help? Ben Kacyra, one of the pioneers of Laser Scanning technology, founded Cyark, an organization with the mission of digitally preserving cultural heritage sites using laser scanning and other digital technologies.